If you aim to be thrifty, it helps to also be creative. Such moments can lead to wonderful inventions like these muffins. I had a squishy banana on the counter and a dab of butternut puree in the refrigerator — not enough for any of my loved projects. I had broken some dried apple slices into small bits to use in cooked cereal. They sat available on the counter. Put it all into muffins with some streusel on top and you have a winner. Frederick wanted to take a bag of the muffins to his charter school pot luck as long as I promised to make more to keep at home. That we did! We have one little one who doesn’t want nuts in his bread or his cookies. I’m flexible — I grind walnuts and add them when he is not looking. Walnuts are in the streusel, but you could put broken walnuts in your muffin batter instead. These muffins are sweet enough you could skip the streusel and frost the muffins once they cool. Now you have cup cakes — great for a kids party. Consider going all whole wheat for a slightly more dense but nourishing muffin. To keep it in the “cake” family, consider some white flour as a trade off to the family eating squash as dessert. Line muffin pans with paper liners or grease them well. This recipe makes 14-18 muffins depending on how much batter you drop in each one. Prepare the streusel topping by combining the flour, sugar, and butter in a medium sized bowl. You want room to work. Use a pastry blender to work the three ingredients into a mealy-looking mixture then stir in the walnuts. Set aside while you prepare the muffin batter. Using a heavy mixer, combine the coconut oil, sugar, and squash puree. Mix at high speed until creamy and perfectly blended. Add the egg and the mashed banana. Continue at high speed. Add the yogurt. Beat until all is perfectly blended. Sift the flours, baking powder, baking soda, salt, and cinnamon together. Stir the apple bits into the flour mixture. Using a low speed, add the flour mix to the creamy mix a little at a time, scraping the bottom and sides of the bowl for even mixing. Fill the muffin cups 2/3 full. Using an ice cream scoop can be helpful for the job. Divide the streusel topping among the muffins and pop the pans in the oven. They will bake in 15-20 minutes. Test with a toothpick or sharp knife. The surface of either should come out clean, no raw clinging dough on the sides. Cool the muffins and then store in an airtight container. The flavor improves once they have sat overnight. The fruit flavors blend into a whole new experience. If you have any muffins left, know that they freeze well. 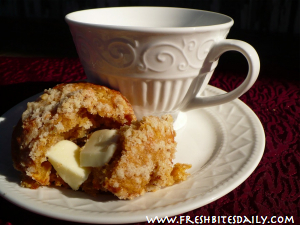 3 Comments on "Winter Squash Banana Muffins"
Interesting combination of ingredients. Especially broken bits of dried apple. I should try it next time I bake some muffins. Thanks for the tips. 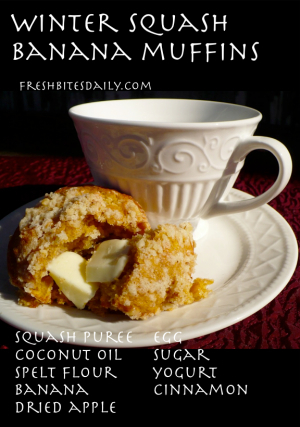 Squash Banana Muffins! Delicious and nutritious! I am craving for a muffin now. I’s yummy with coffee. Thanks for this recipe. Will try this at home now that it’s summer. I think my kids will surely love this.